Myrrh is one of the three gifts given to the baby Jesus by the three wise men. She has a long history of use both for wound healing and as a spiritual aid. Aroma: Spicy, pungent, balsamic, resinous. Colour: Light brown to reddish brown. Plant: A small stunted tree with scanty leaves and small white flowers. Main Growing Areas: Somalia, Ethiopia, the Middle East and northern India. Major Constituents: Delta-elemene, alpha-copaene, beta-elemene, curzerene, furanoeudesma-1,3-diene, curzerenone. Interesting snippets: The name myrrh comes from the Arabic murr meaning bitter. 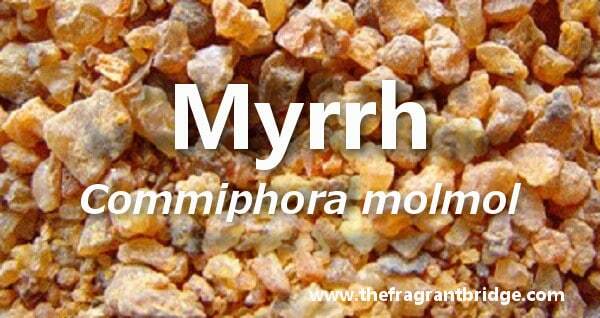 Myrrh was used by the ancient Egyptians in religious ceremonies, embalming, fumigating, cosmetic preparations and perfumes. The trunk of the tree naturally exudes a pale yellowish oleoresin through the fissures in its bark which harden to semi-transparent reddish brown tears on exposure to air. The natives make incisions in the bark and collect the resin once it is dried and ship it off to various countries for distillation. The trees then require 6 months to two years to recover and if not given this time will wither and die. Myrrh was given as a gift to Jesus at his birth and on his death a mixture of myrrh and aloes was applied to the linen his body was wrapped in. Part of Plant used /Extraction: Resin by steam distillation. The resin can contain 25-45% resin, 40-60% gum and 3-8% essential oil. Therapeutic actions: Wound healing, mouth ulcers, dry cracked skin, weepy eczema, tinea, coughs, bronchitis, painful periods. Emotional and Spiritual: Use for people who feel stuck in their lives and want to move forward emotionally and spiritually. Helps balance the upper and lower chakras. 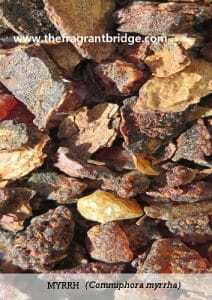 Gabriel Mojay writes that myrrh is able to instil deep tranquillity of mind and is one of the principal oils for overthinking, worry and mental distraction. 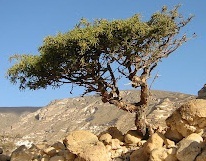 Myrrh subtly helps to close the wounds of both loss and rejection. Remove mundane thoughts and be inspired by what is possible. Tap into your dreams and visions to release a liberating strength and awareness. Be curious, seeing only possibility. 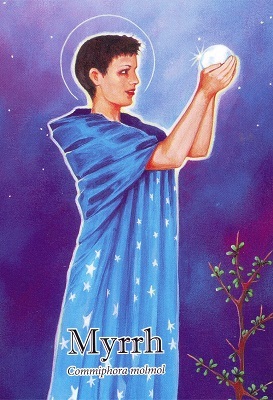 Myrrh helps you be still and grounded while being inspired so that you can manifest your dreams. Are you feeling overwhelmed, rejected, or have lost someone or something precious to you? Are you stressed, confused, worried or lacking clarity? Have you been wounded physically, emotionally, mentally or spiritually? Ask your family, friends and angels to support you through this difficult time. Spend time in nature to bring you some inner calm, peace and tranquillity. Although it may be difficult if you have been wounded, learn to trust both yourself and others again. If you are feeling stressed look at all the possibilities and accept that there may be other answers that you are not yet aware of. This entry was posted in Essential Oils and tagged bronchitis, coughs, dry cracked skin, mouth ulcers, ound healing, painful periods, tinea, weepy eczema on December 23, 2015 by Carole Hodges.